TARPON – The scientific name Megalops suits it well, also nicknamed the silver king, derived from the bright flash that reflects from its body as it jumps. TARPON RECORDS – All tackle 286lbs, fly 202lbs and the Florida record is 243lbs. Though it has surely been broken many times by fisherman who has decided to release the fish unharmed, I know of people, I included, who have measured larger fish. I believe a few of the fish that my charters have landed probably would be close. As for the all tackle world record, without a doubt one lives in Tampa Bay or migrates through every year. TARPON HISTORY – So what else do we know about these prehistoric fish that date back 100 million years? Well every year, especially the last few, scientists in Florida have been spending more time and money studying them. 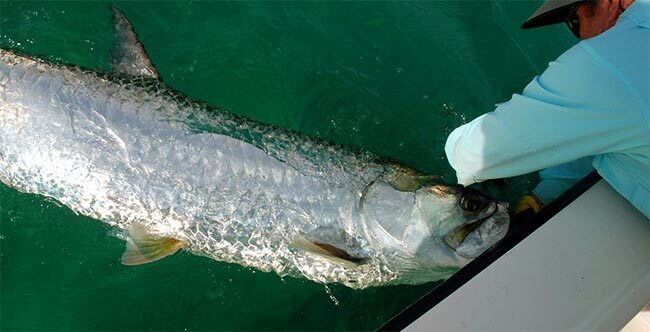 The Florida Marine Research Institute is currently doing a tracking and release study on individual tarpon to determine their survival rate after a long battle. There is still a lot to learn but here are some of the basics we do know, beyond the fact they are one of the most exciting fish in the world to catch. Tarpon inhabit warmer waters; primary the Gulf of Mexico Florida, and the West Indies. Their range extends in smaller numbers as far north as Cape Hatteras and as far south as southern Brazil. In a few rare cases they have even been found further north and south. Female tarpon grow as large as 300 pounds and can reach over 8ft long. The females can live for over 50 years while the smaller males 30 years. The oldest tarpon in captivity lived in an aquarium in Chicago and died at 63 years of age. They are very slow growers and do not reach sexual maturity until 7 years of age and up to 13 years. Tarpon spawn from April through July. Most tarpon fishing is actually done quite close to shore; tarpon spawn offshore on the major moons when the tides are strongest. While other fish are moving into the shallows on major moons others are heading out to spawn. An average 100 pound tarpon is about 13 to 16 years old. One female can lay as many as 12million eggs. For all these reasons it is easy to see why it’s so important to carefully release each and every tarpon. TARPON CHARACTERISTICS – Tarpon are toothless and they swallow their prey whole. That’s why I say as soon as you know the fish has hit tighten down on the line and set the hook. Their mouth is mostly hard, boney and rough like sandpaper. It takes a hard hook-set to drive the hook home. 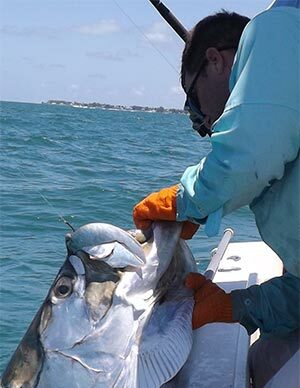 Florida tarpon primary feed on sardines, shrimp, crabs, mullet, pinfish, catfish, needlefish, and will also scavenge the bottom for smaller dead fish. Tarpon are also special because they are one of the few fish in the world that have a swim bladder. It acts as a lung so they can breathe raw air. They can still breathe like most fish breath through their gills. This is one reason it is thought that they can battle for so long, because of the amount of oxygen they are able to take in throughout the fight. For fisherman this is an advantage because tarpon will periodically roll on the surface to grab a breath of air. The faster they are swimming usually the more they will surface making it easy for Florida tarpon Guides like my-self to locate them. I always tell my guys early in the morning on the first tarpon charter to look for something that looks like a porpoise surfacing without the long fin and more of a shine to them. Sometimes all you will see is one fish rise; sometimes it may be 20 or 30 all at one time rolling violently. Many times you will just see a small fraction of the fish roll that is actually in the school. The tarpons primary predator, especially as they get larger, is the shark. Hammerhead, Bull, and Tiger sharks have a particular sweet tooth for them. The good news is that tarpon are poor for human consumption. The only people that really eat them are a few natives in Panama and Africa, where they are actually considered a delicacy, and sold on a small local scale. Lucky for us fishermen tarpon are not sought after for food, this is the biggest reason they are so plentiful and in such fishable numbers. 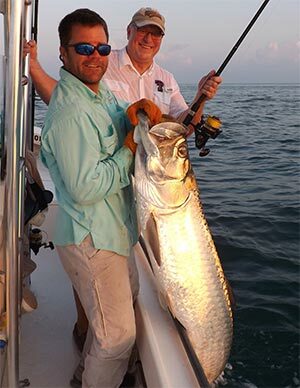 TARPON ADVANTAGE – There has been many polls done and many proclaim tarpon the ultimate sport fish, it’s easy to see why. When it comes to pound for pound explosiveness, endurance, and jumping ability the only fish that can compete is a blue marlin. The big difference between the two is that someone can spend weeks and thousands of dollars to catch one marlin while trolling. I have seen kayakers hook 3 or 4 full grown tarpon in a single day. My boat has lost count of great days with over 25 hook ups. You also have to factor in the fact that tarpon fishing is more exciting, site casting to schooling tarpon, while marlin fishing requires hours of trolling.